My father's paternal great grandmother on his mother's side was a half blood Lipan Apache from Texas, producing my earliest ties to Native Texas blood at least five generations ago, around the mid 1800's. The Apache Nation was the last of the Native American tribes to surrender autonomy to the US Government and allow themselves to be relocated to the reservations of Oklahoma and Arkansas. The name "Apache" means "people of the mountains" and the word Lipan means "warriors of the mountains", a name quite fitting a tribe known for its bravery in battle and its willingness to engage in hostile action rather than avoid it. One of the natural enemies of the Apache were the Comanche, another band of Texas tribes who were more than willing to fight rather than run in the face of confrontation. The Comanche were particularly hostile to the Mexicans, and at various times the Lipan operated under the auspices of the Mexican government to fight the Comanche. But, they were primarily concerned for their own survival, and owed no special allegiance or loyalty to the government of Mexico. They took advantage of opportunity wherever it presented itself and often played both ends against the middle to accomplish their ends. By 1861, the remaining Lipan were forced to relocate to Fort Belknap, Texas, as a sign of allegiance to the US Government which was secretly planning to exterminate the Apache Nation because of their bloodthirsty rampaging against intruders who were trying to settle their native homelands. The Lipan were treated as prisoners of war by the US Government, and in 1867, were forcibly moved to Fort Griffin near the town of Albany, Texas. By 1885, barely 20 Lipan Apache had survived, and those were transferred to the control of the Oklahoma Indian Bureau, signifying the end of a people and a nation. There is, however, a small Lipan Nation that exists today in Texas and Oklahoma, having survived the savage attempts to eradicate a people and their culture. The truth is that the Lipan were not naturally aggressive, but became so when faced with threats that required unconventional methods to repel. The Apache Nation consisted of several tribes in addition to the Lipan: Aravaipa, Chiricahua, Cibecue, Jicarilla, Kiowa, Mescalero, Tonto, Western Apache, and White Mountain Apache. It was a nation of great leaders like Goyathlay (Geronimo), Cochise, Naiche and Victorio among others. And, under the leadership of these great Apache chiefs many milestones were laid. The name "Apache" is a derivative of the Zuni word "apachu", meaning "enemy". The called themselves N'de, Inde or Tinde. It was the Apache who assisted the Butterfield Overland Stagecoach Line in establishing its mailservice through the Apache Pass. But, In 1861, Cochise was arrested for kidnapping, from which he later escaped, then blocked the Butterfield Overland as a revenge against the US Government and its army for killing members of his family who were tricked into being captured. Over the years the US Government entered into several treaties with various tribes of the Apache Nation, and abbrogated most of them. Over an eleven year period between 1862 and 1873, the Apache fought bloody wars against the Confederacy, the California Volunteers and the US Army, especially when attempts were made to remove them from their native lands. 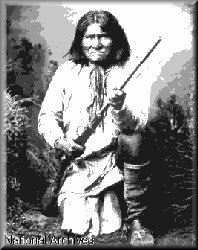 The Apache were one of the most vigilant tribes in defending their homelands, and were more than willing to engage in aggressive and violant battles to protect their territory. It was one of the major reasons why the US Government was anxious to eliminate the Apache Nation under the pretext of protecting "innocent" lives of settlers who were encroaching on Apache ancestral lands, often desecrating their burial grounds and ceremonial sites, actions sure to raise the ire of the Apache people. Typical of Native Texans, the Lipan were more than willing to fight fiercely in defense of their rightful lands, even when such battles eventually worked against them. Below are tables of links to other related web sites including Native American genealogy, Tribal web sites, and personal web sites that have Native American culture as an important element in their content. Visit these sites by clicking on the links below. And please return here from time to time as new information and links are added for your entertainment as well as to assist you in your own genealogy tracing. and are used here by permission of Sam Silverhawk.